Economists and portfolio managers continue to be fascinated by “volatility risk” and their “risk appetites” and, accordingly, nearly every large portfolio that we depend on for our trust and endowment funds, retirement and the public and private pension plans of all sorts, is managed for profit (believe it or not) by a system of “belts”, “braces” and “scaffolding” that seriously embraces volatility risk but does nothing, in itself, to estimate, control or manage the “tail risk” that the method itself creates and leaves behind to roué over another day. The “scaffold”, so to speak. Is that not obvious? If we squeeze the toothpaste in the middle every day, where is it supposed to go? But that’s exactly what we’re doing when we try to tightly bind (“optimize”) the buying and selling activity of tens of thousands of individual investors with many different motivations and sources of information to a “regression line” (the belt), correlations (the braces) and the scaffolding – will that be 40% equities and 60% bonds or 60% equities and 40% bonds. All companies, of course, present “tail risk” all of the time and we, as investors, can only hope that the company management will work it out or do something to save their own companies and their skin, and they are, after all, the best equipped to do so. Our investment criteria is not that we should be tightly bound to a regression line of past success, but that we protect our capital now and have a fair chance to obtain a positive return that exceeds the rate of inflation in the future. However, that observation doesn’t solve the problem that portfolio managers have every day. What do we do with the hundreds of millions of new dollars that we receive every day? Our answer (The RiskWerk Company) is that if they have too much money then they have no choice but to buy real return bonds (RRBs or TIPS) and to have a fair chance to obtain a return that exceeds the rate of inflation, they need to buy the Perpetual Bond™ (which is in equities and deals with the “tail risk”) and possibly the corporate bonds of the underlying. Anything else is just a gamble and our view is that the portfolio manager must be required to prove otherwise should they want to “squeeze” our money into anything else, such as “hedge funds”, “funds of funds” and “alternative investments” in strange locales that we really know nothing about. 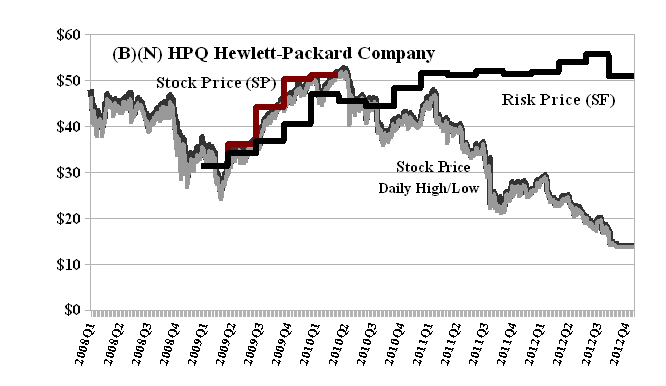 For example, we have had no reason to own the stock or bonds of the fabled HPQ Hewlett-Packard Company since $50 in early 2010 (more than two years ago). The current stock price is $13 but the Risk Price (SF) (Solid Black Line which is a step-function) is $50 and has been at that level through the past twelve quarterly updates to its balance sheet. The “takeover price” is the Risk Price – $50 per share or $90 billion – risk included. Are there any takeover artists, White Knights or Mr. Fixits in your stable of managers who might want to buy it for less or can make a case for $50? Hewlett-Packard Company is a global provider of products, technologies, software, solutions & services to individual consumers, small- and medium-sized businesses and large enterprises, including customers in the government, health and education sectors. 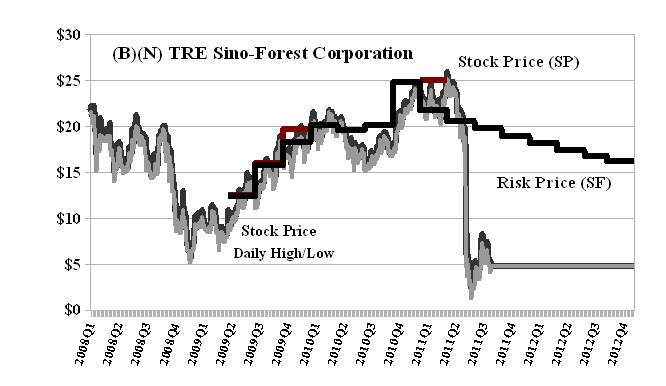 Another interesting example that might engender caution in regulators and foreign adventurers is TRE Sino-Forest Corporation which is currently delisted but trading in the “greys” OTC and might be available for the cost of its alleged “inventory” $4 billion. Indeed. Somebody (not us) was willing to pay $25 for this company in early 2011 that dropped to less than $5 within six months and, of course, many investors were still willing to hold it for $20 even after the whiff of scandal. The Risk Price(SF) makes the situation quite clear months before the alleged scandal. The Sino-Forest Corporation is (was) a commercial forest plantation operator in China and is engaged in the ownership and management of forest plantation trees and the marketing and sales of standing timber, wood logs, and the complementary manufacturing of downstream engineered-wood and finished products. The literature on this subject is legion (thousands of articles every year) as professionals of all sorts continue to try to explain Why the Capital Assets Pricing Model (CAPM) and Modern Portfolio Theory (MPT) don’t work. There are certainly lots of articles in these Posts that explain that but the facts have been well-known for decades. For example, the economist, John Lintner (Harvard 1965), showed early on that the Capital Assets Pricing Model could only work if the markets were “efficient”, transaction and borrowing costs were zero, and stock prices (or returns) were jointly log-normal. That, of course, is not true for any stock let alone all stocks in any market. Mr. Markowitz (the inventor of mean-variance analysis) has also been very reflective in a recent FAJ article (please see 1999 below) and has always advocated a “minimize maximum loss” approach (of which the Risk Price is an example). Financial Analysts Journal, July/August 1999; 55, 4.